ARE YOU READY TO INCREASE YOUR PRODUCTIVITY BY UP TO 50% WHILE REDUCING NECK, SHOULDER & BACK PAIN? No need to waste your time at work feeling groggy, unmotivated or unhappy. Using our Monitor Desk Arm you can choose the perfect position & angle to place your computer screens. No more slouching or arching your back which leads to poor posture and back pains. Maneuver your screens to the most comfortable and healthiest position possible. Tilt your screens at any angle to prevent screen glare on those sunny days while working at home or at the office. Spend more time working, less time being irritated. Your health is your wealth. We've all heard this saying. But how many of us actually live by this. It's easy to say but harder to do. With this Dual Monitor Mount you can finally have the perfect, most focused working environment while preventing & reducing your eye, neck, shoulder & back pain. 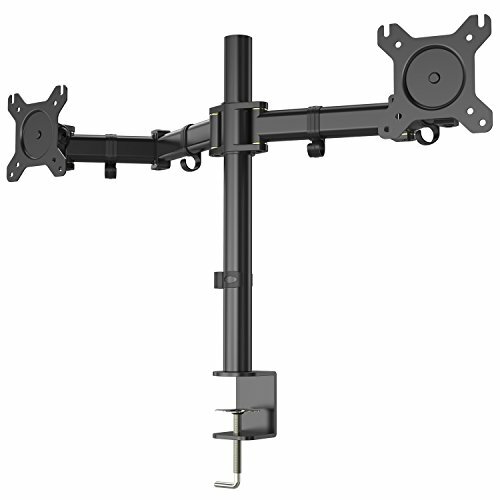 Your brand new Double Monitor Mount will help you to improve your health by allowing you to spend less of your time arching your neck and back downwards and straining your eyes to see your screen clearly. Easily adjust your monitors to your desired position & angle which as a result will not only improve your health but also help you to create a more focused & ideal working environment for yourself! Get up to 50% More Work Done & Prevent Eye, Shoulder & Neck Pain OR We'll Send You a Refund! If You're Ready to Increase Your Productivity by Up to 50% & Reduce the Pain in your Neck, Shoulders & Back therefore Improving Your Posture & Health, Click the Add to Cart Button Now to Find Out What You've Been Missing! View More In Computer Carts & Machine Stands.